Paul Black of the Madison Scouts sent in this one: "This is a picture of (from left to right) Rowan Sbaiti, me, Galen Cook, Peter Dougherty and Steven Tann. 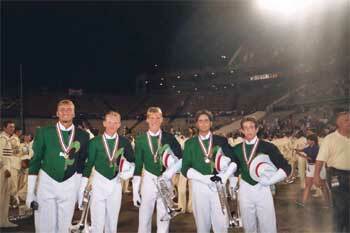 Rowan played baritone, Peter played soprano, and Galen, Steven, and I played mellophone in the 2003 Madison Scouts. "Rowan, Galen, Steven and I all go to the same high school. Galen is our high school drum major. Peter goes to our 'rival' school down the road. We are all seniors except for Rowan, who is a junior. We had a great time becoming Madison Scouts this summer." Thanks Paul!